This harpist has been playing and singing for many years and has played for Presidents, Prime Ministers and other dignitaries both nationally & internationally. This harpist has been playing, singing and composing music for many years and has played for Presidents, Prime Ministers and many other dignitaries both nationally and internationally. Áras and Uactarain, Dublin Castle, Luttrellstown Castle and Saint James Palace are among the places where she has played. The Traditional airs and melodies which she plays are unobtrusive and can set the mood for any occasion. 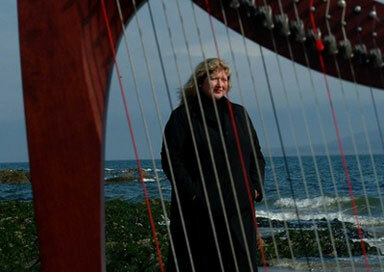 She is a classically trained harpist, pianist and singer and an accomplished Traditional Harpist with titles including 'All-Ireland Harpist' to her name. She creates and enchanting paradise through the romantic and mystical sounds of the harp and your guests will relax and enjoy the Harp cast its lyrical spell. With many years experience in the music business, this musician knows how to deliver the sounds that will ring true to your ears and bring a sense of calm and serenity to the occasion. Prior to your wedding she will discuss what music requirements you may have. This consultation takes into consideration the sort of ceremony you have in mind so that a sense of unity can be achieved. She also works with other musicians and is in a trio with violin, flute as well and harp. They have been performing together for some years and have many happy clients. Through their talent they can create a warm and memorable experience. She can provide other musicians if required - Uilleann piper, organist, accordion players or guitarist.